Our mission at Timothy's is to consistently exceed our guest's expectations. In order to accomplish this, guest information is collected both online and offline to further enhance our level of service and provide our guests with information that they request. Privacy of Guest Information: Timothy's is committed to protecting the privacy of our guests. We do not disclose any personal information that you provide, such as your name, email address, or telephone number, to any outside parties, except when we believe it is required by law or to protect our company, customers, or others. We do not sell, rent or exchange our lists. If you choose to provideTi mothy's personal information, we will use it solely for the purpose to better serve you, our guest. We voluntarily collect guest information for the primary purpose of communicating information about events and special offers with our guests. Guest spending is also tracked for measuring the effectiveness of our restaurant services and marketing efforts. 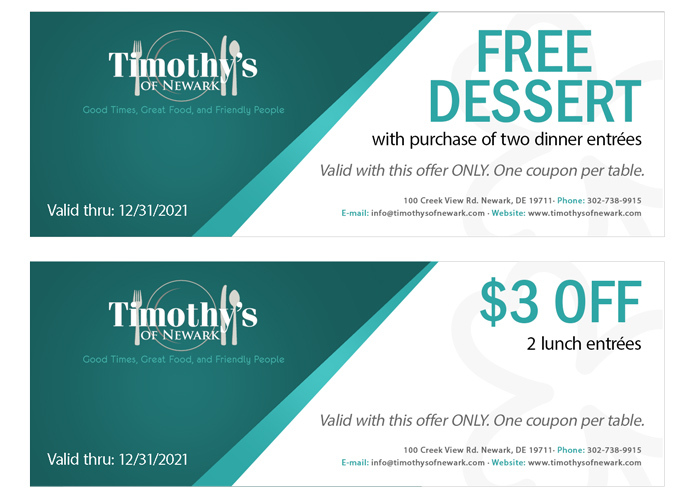 From time to time, Timothy's may send direct mail to our registered guests regarding certain information on upcoming events or specials we believe are relevant. Timothy's uses reasonable technological safeguards and other measures to protect the security of the personal information we collect for our guests. Timothy's does not knowingly collect or use information from users under age 13. No information should be submitted to Timothy's by guests under the age of 13. In the event Timothy's becomes aware that a guest under the age of 13 is receiving our communications, we will delete that guest’s information from our records.